We’d love your help. Let us know what’s wrong with this preview of Selected Philosophical Writings by Thomas Aquinas. St. Thomas Aquinas (1225-1274) saw religion as part of the natural human propensity to worship. His ability to recognize the naturalness of this phenomenon and simultaneously to go beyond i - to explore, for example, spiritual revelation - makes his work as fresh and readable today as it was seven centuries ago. This accessible new translation offers thirty-eight substantia St. Thomas Aquinas (1225-1274) saw religion as part of the natural human propensity to worship. His ability to recognize the naturalness of this phenomenon and simultaneously to go beyond i - to explore, for example, spiritual revelation - makes his work as fresh and readable today as it was seven centuries ago. To ask other readers questions about Selected Philosophical Writings, please sign up. Reading Aquinas is like listening to your Aunt Bev lecture you on post WWII politics...utterly boring but you know you are obligated to listen and simply nod your head and say "mmhmm" every minute or so. Nevertheless, I did absorb a good amount of this material. And despite all the repetition, there were a few gems in this book, as it is organized quite nicely with an index in the back which I am sure I will consult anytime I need Aquinas' philosophical opinion on the matter. I always forget that Thomas is surprisingly funny. The law section was revolutionary and fascinating. Still prefer to watch paint dry, not because it's more interesting but because it's less theologically problematic. This book is full of earlier Philosophers work, such as Aristotle, Pseudo-Dionysus, Boethius etc.. it does have Aquinas own take on matters. The book skips back and forth and is very repetitive for the few gems within. one thing is clear, that Aquinas was borrowed out of context by Catholicism and the fact he draws heavily on Earlier Greek philosophy proves it. Some really good sections on life after death, energy and soul. Overall I found the reading repetitive and tedious in places. Of course, I didn't read all of it. How could I. But I did read some of it for a class I took on Aquinas's Philosophy of Religion last semester when I was studying in Dublin. And I feel like that effort counts for something. Extremely glad I read this. Some arguments are unstable(very few), but for the most part very sold. 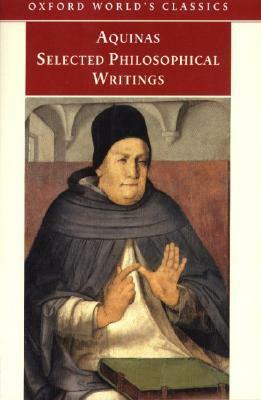 Aquinas is a methodical thinker with some useful insights, but based on this translation I would never read him again. The writing is unbearably dull. I had to really slog through this one. I am so heartbroken to be away from England that I am giving all its related books mediocre reviews. Nice compilation of some of the Dumb Ox's writings. It's fairly standard Aquinas. If you don't want to spend the money on Aquinas' actual volumes, I would recommend this text and the one called "Selected Writings" published by Penguin. I would start with this one, and then move on to the Penguin one. It's a good way to understand Aquinas' main conclusions and arguments (albeit this is just brushing the snow off, not even scratching the surface. Aquinas runs deep...) and figuring out if Aquinas i Nice compilation of some of the Dumb Ox's writings. It's fairly standard Aquinas. If you don't want to spend the money on Aquinas' actual volumes, I would recommend this text and the one called "Selected Writings" published by Penguin. I would start with this one, and then move on to the Penguin one. It's a good way to understand Aquinas' main conclusions and arguments (albeit this is just brushing the snow off, not even scratching the surface. Aquinas runs deep...) and figuring out if Aquinas is the kind of thinker you resonate with. Thomas Aquinas (sometimes styled Thomas of Aquin or Aquino), was a Dominican friar and priest notable as a scholastic theologian and philosopher. He is honored as a saint and "Doctor of the Church" in the Roman Catholic tradition. Aquinas lived at a critical juncture of western culture when the arrival of the Aristotelian corpus in Latin translation reopened the question of the relation between fai Thomas Aquinas (sometimes styled Thomas of Aquin or Aquino), was a Dominican friar and priest notable as a scholastic theologian and philosopher. He is honored as a saint and "Doctor of the Church" in the Roman Catholic tradition.